Water companies are increasingly targeting companies that breach their pH consent, as unbalanced effluent entering the sewer network can erode their sewer pipes. Normally effluent pH has to be between 6 and 10 before it can be discharged to sewer. Many effluent streams need pH balancing before being discharged from site, particularly from companies such as food manufacturers that have a high organic waste stream which decays to acid. Food companies also use CIP or other caustic cleaning processes which also require pH balancing before discharge. 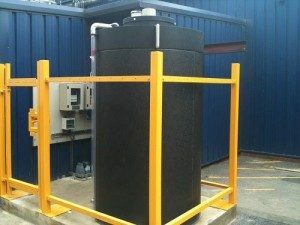 MPAC Ltd specialise in the Smart Storm range of chemical dosing systems adaptable to any site requirements. 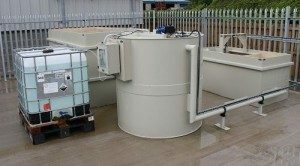 From small balancing tanks to systems integrating full aeration mixers and proportional pH dosing control, MPAC Ltd. will design a cost effective system to suit your needs. Tanks are reinforced and come complete with a mounting plate for electric mixers, an injection gland for caustic or acid and an inspection cover. Included also is a mounting bracket to house dosing pumps and pH meters. Inlet and outlets are 90mm but other sizes can be accommodated. Standard sizes are 1.2m diameter x 1.5m height and 1.5m diameter x 2m height. Custom tank sizes can be made to order on request. Optional impeller mixers or aeration mixer can be included, please contact us for further details and quotations. pH balancing systems are supplied as fully installed turnkey projects.